To me, this symbolizes what Record Store Day should be all about (Aside from my local store doing a bit of price gouging and selling this for $4 more than anywhere else I saw it being sold). There is an actual point to this reissue. This is not some record from the 70's littering used bins everywhere; it's a record that never came out on vinyl. It's about time too. 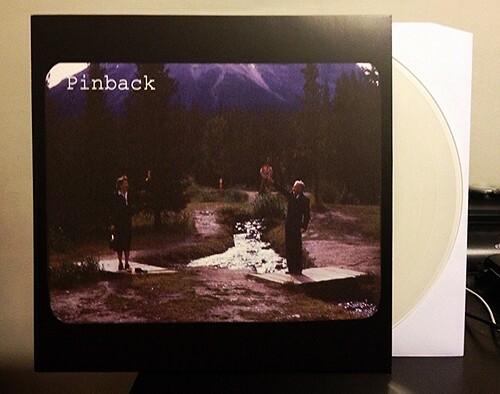 I have to admit, prior to getting this reissue, I'd never heard this Pinback record. Don't get me wrong, I'm a really big fan and have been for years. I've been on board since Blue Screen Life, but for some reason I never went backwards and picked up their first full length. Well shame on me because this record is every bit as good as the rest. Pinback songs have a way of chugging along at the type of slower pace that would typically bore me if other bands were doing it. But the way they layer the gentle plucking of the guitars and the absolutely stellar backing vocals and melodies make the songs just bristle with energy, despite their somewhat slow pace. This record is just full of great songs like that. Pinback seems to be one of those bands that just emerged perfect. There was no tinkering with the formula necessary, they were just ready to go. Thrilled to have this in the collection finally.